Papa Roach have outlived many contemporaries since their start in 1993. Their journey through rap-metal and anthemic alt-rock has seen them nominated for two Grammys, sell more than 20 million albums and chart regularly. Like its predecessor, Crooked Teeth, this 10th album is heavy on production and industrial layers but it takes bolder risks stylistically. An incohesive tracklisting and eclectic influences make for a confused and unconvincing first listen, but it has immense growing power thanks to some seriously catchy tracks with memorable riffs and melodies aplenty. The Tron-worthy, electronic opening of The Ending raises some eyebrows, but the riff does the band proud. This, along with well-chosen singles Renegade Music, the Rage Against The Machine-esque Who Do You Trust?, and Not The Only One’s deliciously sing-along vocal hook, are the stickiest tracks on here. However, pop-punk number Feel Like Home should go down well live and Top Of The World is a radio-friendly guilty pleasure that, despite some cringeworthy effects, has the type of stadium-worthy chorus heard in Born For Greatness, which was also produced by Jason Evigan. Sadly, bookended by the solid opening and closing tracks there are also some frustratingly uninventive misses. Elevate drags despite the interesting tempo and showy rap, Come Around, Problems and Maniac are authentic but bland, and the raw, quick, old-school punk of I Suffer Well feels strikingly out of place on this otherwise squeaky-clean album. Still, with less than two years between releases, it’s no surprise that some songs might have been best left on the cutting room floor. Thankfully, seductively prowling, synth-heavy track Better Than Life, with its big sweeping chorus, delivers a great closer. 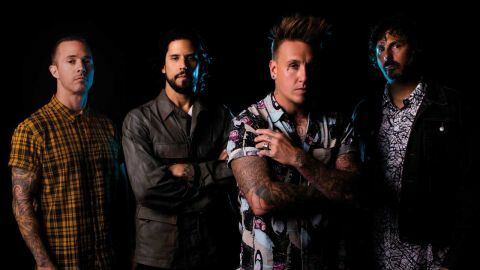 With so much production, it’s hard to imagine much of this album on tour, but Papa Roach are obviously in adventurous mode so, whatever happens, they’ll certainly make it entertaining.